SlotsMillion is the world’s first Virtual Reality online casino and now it is available to UK players! Start your VR Casino experience with 100 Bonus Spins and 100% a cash match bonus worth up to £/€100! 18+. New customers only. Minimum deposit of £20 required. 48x Wagering requirements on both the money and spins bonus. Maximum bonus bet is £5. Limit of withdrawal from Bonus Spins winning is £200. Any unused extra spins and, or, bonus money will expire after 7 days. Full terms and conditions at SlotsMillion. 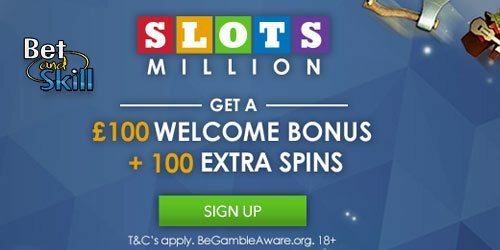 SlotsMillion Casino has a huge selection of slots and games for you to explore brought to you by MicroGaming, NetEnt, Playtech, NextGen Gaming and a long list of many more. As well as our large selection of games, at SlotsMillion you can also play VR games in the world's first ever virtual reality casino - bringing you the most up-to-date technology and keeping you at the heart of innovation. Gonzo’s Quest extra spins will be added to the player’s account right after your first deposit. Following packages of extra spins will be added to the player’s account the following days at 09:00 AM. Extra spin winnings are added to the player’s account as bonus money. All winnings accumulated from extra spins have a x48 wagering requirement before a withdrawal can be made. Winnings generated with bonus money and converted to real money have a withdrawal limit of £200. The welcome pack deposit offer is a 100% bonus up to £100. Minimum deposit to claim the Welcome Offer is £20. Bonus money will be converted to real money balance once it has been played 48 times. For example, £10 bonus money will be converted to real money balance once the player has placed bets in total value of £480. Maximum bonus bet is £5 or £0.50 per bet line. If the player plays with higher stakes, the winnings will be void and the bonus money will not be converted to real money balance. "SlotsMillion Bonus: 100 extra spins + 100% on first deposit"